Starring: Gillian Anderson, David Suchet, Ray Winstone, Douglas Booth & Harry Lloyd. This three part mini-series based on Charles Dickens novel, Great Expectations has been adapted by writer, Sarah Phelps (Oliver Twist, Dickensian). The story centers on orphan Pip (Douglas Booth) and his transformation to becoming a gentlemen when a mysterious benefactor leaves him a large sum of money. This BBC production was directed by Brian Kirk (Luther, Game of Thrones) and stars Douglas Booth (Noah, Jupiter Ascending), Ray Winstone (The Departed, Snow White and the Huntsman), Gillian Anderson (The X Files, Hannibal) and David Suchet (Agatha Christie’s Poirot, The Bank Job). This adaption forms the centrepiece of the BBC’s celebration of Dickens as we move into 2012 and the bicentenary of his birth. The most recent version of the novel to have been shot by the BBC was in 1999 and starred Ioan Gruffudd as Pip and Charlottte Rampling as Miss Havisham. This version aims to capture the romance whilst giving it a thrilling edge. For those unfamiliar with the story, it tells of young orphan Phillip Pirrip (Pip) who lives with his sister and her husband, the kindly blacksmith Joe Gargery. Local spinster Miss Havisham requests his company at her home where she entertains herself by encouraging her adopted daughter Estella to be cruel to the young boy. As he grows up, Pip’s circumstances change after the visit from Mr Jaggers who brings news that an unknown benefactor has left a substantial fortune on the condition that the boy is educated as a gentleman. Consequently, Pip travels to London where he lodges with Herbert Pocket, a boy from his youth and it is there that Pip finally learns the truth about his benefactor. The filming for this adaption took place near Fairfield, at the isolated St Thomas Becket Church, which is situated on Romney Marsh. This iconic location was the ideal setting for the opening scenes, where Pip visits his parent’s graves and instantly the theme is set in a melancholy manner. Dickens found inspiration for this scene from another Kentish Church, St James’ at Cooling, on the marshes near the Hoo Peninsula. An interesting piece of trivia for Dickens fans of Dickens is the fact that the role of Herbert Pocket, Pip’s friend in London, is played by none other than Charles Dickens’s great, great, great grandson Harry Lloyd, who also featured in a remake of David Copperfield starring a young Daniel Radcliffe (Harry Potter). Filming took place near Fairfield, at the isolated St Thomas A Becket Church. Situated on Romney Marsh, it was the perfect setting for the bleak opening scenes of the novel where Pip visits the graves of his parents. Another Kentish church, St James’ at Cooling on the marshes near the Hoo Peninsula , inspired Dickens to write this dramatic scene which also introduces Pip’s nemesis, prisoner Magwitch. 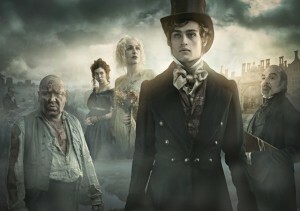 Great Expectations aired on BBC1 from Tuesday 27 December 2011 at 9pm and is now available for DVD purchase. This entry was posted in Filmed in Kent and tagged David Suchet, Douglas Booth, Gillian Anderson, Great Expectations film locations, Ray Winstone, St Thomas A Beckett Church, TV Drama. Bookmark the permalink.